A peak behind the curtain makes the gruesome video look a bit different. If you're anything like us, you've watched the new Panic! At The Disco video for 'Say Amen (Saturday Night)' a few hundred times since it came out a couple of weeks ago. While the video itself is pretty hammed up and gruesome, the behind the scenes look makes the whole thing kind of hilarious. "We're throwing dudes through windows and blowin' stuff up. 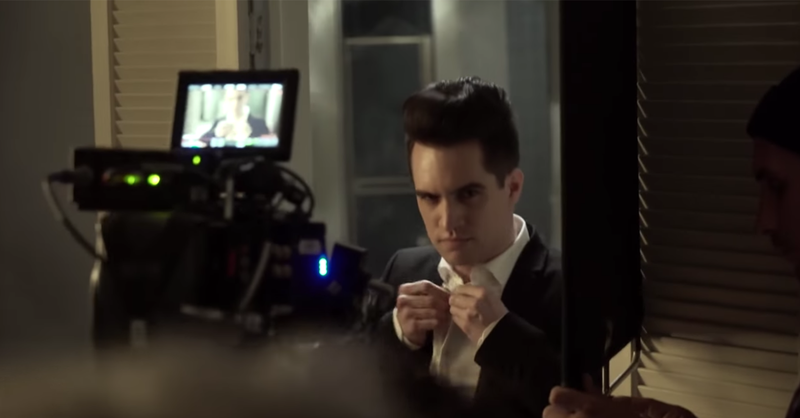 It's no big deal to me" shrugs Brendon Urie, as a production assistant is carefully spraying blood splatter from a spray bottle. Masked assailants are moonwalking in the background. It's a wild ride. Panic! At The Disco are releasing their new album 'Pray For The Wicked' on June 22nd through Fueled By Ramen. Get all the info here.